Bordeaux has improved its image and facilities in recent years and now celebrates its river (Garonne) with a River Festival in May/June – Bordeaux Fête le Fleuve with singing and dancing on the quays throughout the weekend. Previously the riverside tended to be more industrial and dilapidated – or bordered by heavy traffic – so along with many other aspects of the city it has become more visitor-friendly and relaxed. Bordeaux will play host to a new festival open to the public and centred on the Garonne river, music, and dance . In previous years this has coincided with the arrival of the Belem, France’s last surviving three-masted tall ship, which will drop anchor in the Port de la Lune, in the heart of the UNESCO World Heritage Site. For 10 days, the Bordeaux waterfront will be swarming with experienced yachtsmen and sailing enthusiasts: excitement and atmosphere guaranteed! As part of our series highlighting places to stay, eat. visit, shop etc in France, the City of Bordeaux has been transformed in recent years from a rather sombre, mercantile city and port into a modern and vibrant centre for a long weekend or longer…..
Bordeaux City Centre Apartment – selected for its location in the heart of the city just off the fashionable Rue des Remparts. This pedestrianised street is situated between the prestigious shopping street “Cours de l’Intendance” and the city’s fine Cathedral “St. André”. Rue des Remparts offers a smart selection of bistro restaurants, cafés, boutique clothes and jewellery shops, delicatessen and specialised gift shops. Le Vieux Bordeaux – Nearly a neighborhood institution, this restaurant ranks among the top five in a highly competitive market. Specialties include roasted sea bass on a gratin of pulverized black olives; thin-sliced escalopes of duck foie gras with coffee-flavored sauce; and “Oriental” (sweet-and-sour) pigeon with lime sauce. For a fixed price lunch expect to pay around €19. Tel no. – 05-56-52-94-36 Address 27 rue Buhan – Booking Essential! 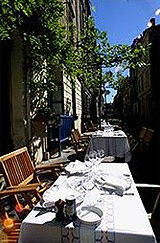 La Tupina – One of Bordeaux’s most talented chefs runs this cozy spot with a summer terrace near quai de la Monnaie. It’s been called “a tribute to country kitchens and the grandmothers who cooked in them.” Jean-Pierre Xiradakis’s specialty is duck, so your meal may begin with croutons spread with duck rillettes, and the kitchen often uses duck giblets, skin, and livers in salads. Other specialties are roasted shoulder of lamb en confit with garlic and white beans, lamprey eel à la Bordelaise, and steaks grilled and barbecued at the table. Desserts usually include pears marinated in red bordeaux wine. Website www.latupina.com – 6 rue de la Porte de la Monnaie Tel no. – 05-56-91-56-37 For a fixed price lunch or dinner expect to pay around €50. Booking recommended. 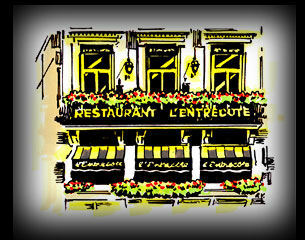 L’entrecote – A bordeaux institution. The best steak and chips in Town – not suitable for vegetarians! 4 Cours du 30 Juillet. Tel no. 05 56 81 76 10. Not necessary to book, but arrive early as long queues are the norm. Pepone Italian – 31 Cours Georges Clemenceau, 33000 Bordeaux – 05 56 44 91 05 Superb pizzas and anti pasta. Expect to queue. The quarter of Saint-Michel, built around the flamboyant gothic style Basilica, dedicated to the Archangel is by far the most lively and colourful quarter in the city. There is a market under the beautiful spire every Monday and Saturday morning, and the shops around the square make for a lively and authentic atmosphere that the Bordelais poets such as Meste Verdié and Ulysse Despaux have always appreciated. Musée d’Aquitaine An outstanding museum with over 25,000 years of history end ethnography. Exceptional artefacts include several prehistoric stone carvings of women and a collection of Gallo-Roman steles, statues and ceramics. Musée des Beaux-Arts Bordeaux’s fine art museum, is located in two wings of the 1770’s Hotel de Ville (2 minutes walk from the Apartment). It includes 17th century Flemish, Dutch and Italian paintings and 20th century works by Matisse, Picasso and others. Just around the block is the Galerie des Beaux-Arts, which hosts short-term exhibitions (check the Bordeaux Tourist information official website for up to date information). CAPC Musée d’Art Contemporain Housed in what was the main Colonial Foodstuffs Warehouse in the 19th century, this museum features more than 600 works by more than 100 artists. It includes French paintings from the 1970’s, paintings from the 1980’s and a selection of works by contemporary artists. Musée d’Histoire Naturelle The natural history museum is located near the Jardin Public. This museum was founded at the time of the French Revolution. There is a huge collection of animal and plant specimens, particularly on the regions famous palaeontology. Notre-Dame Church The very pinnacle of Baroque art in Bordeaux, the church has a brilliant décor of exceptional quality: wrought-iron work, a superb organ case, a pulpit carved in red marble and 18th. century paintings. Place de la Bourse Open to the river, dedicated to Louis XV, the square remains one of the purest “classics” of 18th century style. An equestrian statue of Louis XV used to stand in the middle. It was destroyed during the revolution and later replaced by the Fountain of the Three Graces (Queen Victoria, the Empress Eugénie and the Queen of Spain). This was the first monumental ensemble to be illuminated in the city’s ‘Plan Lumière’. The Grand Théâtre Built from 1773 to 1780 by architect Victor Louis, The Grand Théâtre, a master-piece of neo-classical architecture stands on the site of a Gallo-Roman monument, the Piliers de Tutelle temple, which was destroyed in 1674. Restored to its original décor, the auditorium is admired as one of the finest in the world. The stairwell is grandiose and the stairs are decorated in the antique style featuring a caryatid theme. The Jardin Public Representing 10 hectares of public gardens in the city centre, The Jardin Public was created by Tourny, Royal Intendant, in 1746. It was designed to link the city with Faubourg Saint-Seurin and Chartrons. In 1856, the garden was re-developed in the “English” style by landscape architects Fisher and Escarpit. The Botanical Gardens have been present here since 1855, and feature a collection of around 3,000 different species of living plants. “Family Plus”, an ideal destination for the young and the not so young! Families travelling with young children can rely on the “Family Plus” hallmark and seal of approval to make sure their holiday in Bordeaux is a success. The hallmark makes it easy to see just what is on offer for families in terms of holiday destinations and family-friendly services available when they get there. …and then they can get together again afterwards. Train TGV to Bordeaux now offers faster journey times! Bordeaux has a host of specially organised year round attractions and events.Here is a small selection of a few of them. For further information regarding any of the below and a full listing of what’s on, please contact Bordeaux Tourist Information centre. Bric-a-brac Market 22-23 November 2017 . The lively Foire à la Brocante (bric-a-brac market) takes place in Bordeaux’s Place des Quinconces every spring and autumn. Although not as prestigious as the annual Antiques Fair, attendance is free and you may just uncover a prize antique…Around 300 traders from all over France and Europe attend. Quality is not guaranteed, nor is authenticity, but prices are affordable and there is a vast choice of 17th-19th century antiques, ranging from furniture to postage stamps, antique jewellery, dolls and pictures. Vinexpo One of the world wine industry’s premier trade events held at the Parc des Expositions. Each year more than 2500 exhibitors will be pushing their wines to some 60,000 trade and press visitors. Bordeaux is undoubtedly most famous worldwide for its superb wines. It is the capital of the region known as Aquitaine and is a major cultural centre and a transportation hub between southern France and Spain. The elegant city is rich in history, culture, arts, music, legendary wines and gastronomy. It is not only the fine wines capital of the world but also a vibrant centre of trade, industry, services and business. The city centre is known for its neoclassic architecture and wide avenues, which over recent years have undergone a major investment programme to include cleaning up the building facades and renovate the quayside, to make a fashionable restaurant and bar district. A state of the art tram system is now operating in the city, which has reduced traffic congestion and left the city centre pedestrianised and easy to navigate. Bordeaux is a fantastic showcase for Romanesque, gothic and Renaissance art displayed in museums, churches, forts, galleries, mansions, gardens and public walkways and buildings. The elegant city is rich in history, culture, arts, music, legendary wines and gastronomy. It is not only the fine wines capital of the world but also a vibrant centre of trade, industry, services and business. The city centre is known for its neoclassical architecture and wide avenues, which over recent years have undergone a major investment programme to include cleaning up the building facades and renovate the quayside, to make a fashionable restaurant and bar district. A state of the art tram system is now operating in the city, which has reduced traffic congestion and left the city centre pedestrianised and easy to navigate.